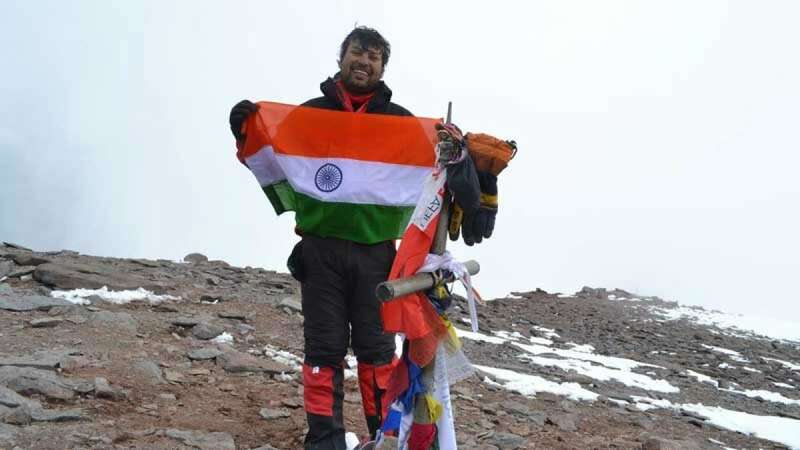 New Delhi : Indian mountaineer Satyarup Siddhanta is all set to create a world record and register his name in the Guinness Book of World Records by becoming the youngest person to scale both the seven summits and the seven volcanic summits. Currently, the record is held by Australian mountaineer Daniel Bull who achieved this feat at the age of 36 years 157 days. Satyarup will be 35 years and 9 months this January when he starts ascending the last volcano on the list - Mt Sidley - the highest volcano of Antarctica. Bull (Australia, b. 21 November 1980) created history by reaching the highest volcano in the world, Ojos del Salado, situated in Argentina-Chile border, on 27 April 2017. Satyarup has already completed the Seven Summits present in the list and so far scaled five of the seven volcanic summits. On November 29, Satyarup is headed for Mexico to climb the highest volcano of North America - Mt Pico De Orizaba. He will be making his ascend for the summit in the first week of December. Once successful, the mountaineer would aim to climb Mt Sidley on January 18. Earlier last week, Satyarup returned from Papua New Guinea after climbing the highest volcano of Oceania - Mt Giluwe - and the highest mountain of Papua New Guinea - Mt Wilhelm - to become the first Indian to summit each of them. Mountaineering is an expensive adventure sport and Satyarup has been receiving financial support from various corporate groups from time to time. Manipal Group, Tata Trust, Wow momo, Favre-Leuba, Meraqee, Kunj Alloys, Wakefit, CFRCE and some more companies have already extended their help to make Satya’s dream come true. From an asthmatic kid to world-famous mountaineer Satyarup's journey, so far, has been extremely inspiring. Such is his passion for climbing that Satyarup didn't think twice to leave his regular job before making his first attempt to scale the Mt Everest in 2015. He has already summited the highest mountain peak in the world twice. Satyarup, who hails from West Bengal, has proved that if one is ready to brave all odds of health and finances and remain focused towards his/her dream then nothing is going to stop him/her. "I can't express how excited I am to enter the final lap of my journey. My dream of becoming the youngest person to scale the Seven Summits and Seven Volcanic Summits is just two attempts away. It's never an easy task, but I am determined to successfully scale these two summits and bring laurels to my motherland. The good wishes of my fellow countrymen keep motivating me. With these ascends, my aim is to promote adventure sports amongst young Indians," said Satya before leaving for Antarctica. With support from the government and private companies, Satya aims to take Indian Mountaineering to new heights and promote it as a sport in India. He has not only climbed Mt. Everest, but also skied the last degree to the South Pole, covering a distance of 111 km in over 6 days, carrying a 50kg sledge. Sir Robert Swan, the polar legend, had advised Satyarup to keep inspiring young Indians with his amazing feat of dreaming big and winning over personal limitations. 7 summits scaled by Satyarup, Mt Kilimanjaro (Africa), Mt Elbrus (Europe), Mt Aconcagua (South America), Mt Denali (North America), Mt Mont Blanc (Western Europe), Mt Kosciuszko (Australia), Mt Everest (Asia), Mt Carstensz Pyramid (Oceania), Mt Vinson Massif (Antarctica), Mt Wilhelm (Oceania). The five volcanic summits on which Satyarup has hoisted the Indian Flag are as follows: Mt Kilimanjaro (Africa), Mt Elbrus (Europe), Mt Ojos Del Salado (South America), Mt Damavand (Asia), and Mt Giluwe (Oceania). Mt Pico De Orizaba (North America) - planned for December 1st week - followed by Mt Sidley (Antarctica) - planned for January 18, 2019 - are left to be scaled. We wish Satyarup Siddhanta all the very best in his endeavour and hope he returns India successful.